Read my first post about the beginning of this project here. Kind of scuptural as is. We then filled in the equator in several apply/set steps. 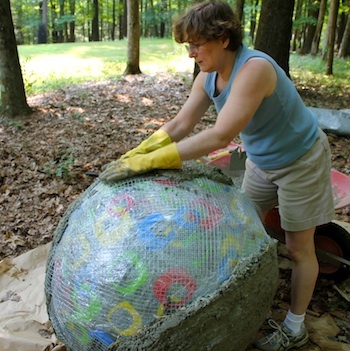 We had to keep the balls wrapped in plastic and wet between applications because the weather stared getting very hot. We wanted to slow the curing process down so the two first balls were wrapped and ignored for several days as we tackled the big ball. 1. 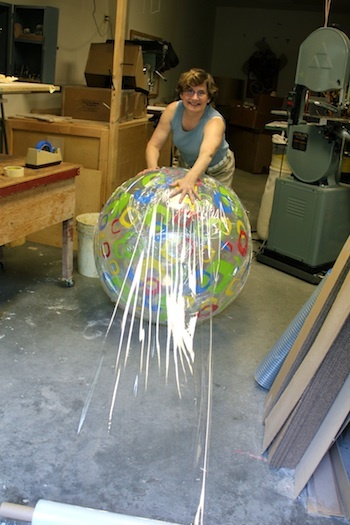 We wrapped it in multiple layers of plastic film hoping to be able to reuse the ball but also to skip the taping of the edges step. This was a mistake. We couldn't get the ball out of the sphere and the ball did get punctured. We kept a compressor nearby and kept filling it up until the first layer was set. 2. 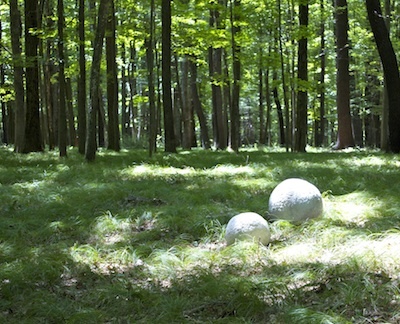 We moved our work area into the woods near the final location because we don't think this big ball will be easy to move once complete. 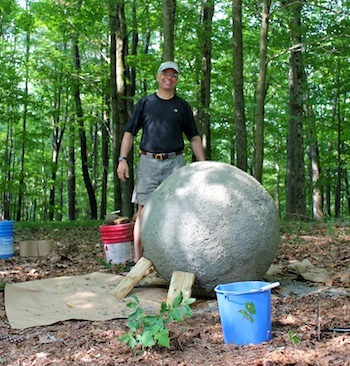 This was a good choice because we were out of the sun and the final ball is about 400+ lbs we estimate (based on the number of bags of concrete we used- 8 for this one ball). It was a better work area and we stopped filling the lawn with concrete droppings. Just don't wear crocs to work in the woods! 3. We tried a modified collar supported on five gallon buckets. While this worked well on the smaller balls it didn't on the larger one. It caused a fairly large ridge that we couldn't remove later. The ball has more imperfections in shape because of it. It was better just working the ball without the collar and applying the cement in sections. 4. The cement worked well into the 1/2" mesh. The little stones in the cement fit better. 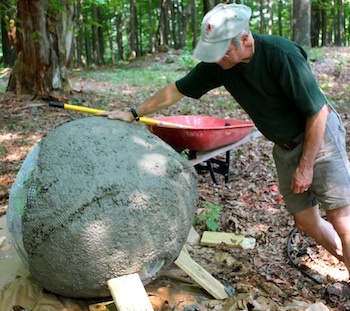 It is really looking impressive and quite round in spite of the lumpy ridge we made with the collar. It is so round that we had to prop it to keep it in place. 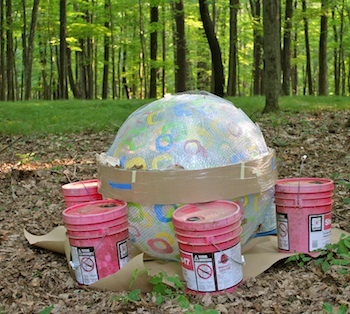 As we worked the biggest ball, our two first balls were happily curing in their plastic bags. Finally, we loaded them onto a cart and wheeled them into the grassy glade to get a first peek. Very cool. We knew we needed more. So another trip to Lowe's, more of everything and some more experiments. Simply wonderful and so creative! You are adorable! I love your blog and your clever ideas working with nature and beauty that any one else would over look! Thank you! Thanks for visiting Christy. Visit often. I am new (fairly) to blogging but have been creating my whole life. Lots more to share! HI! 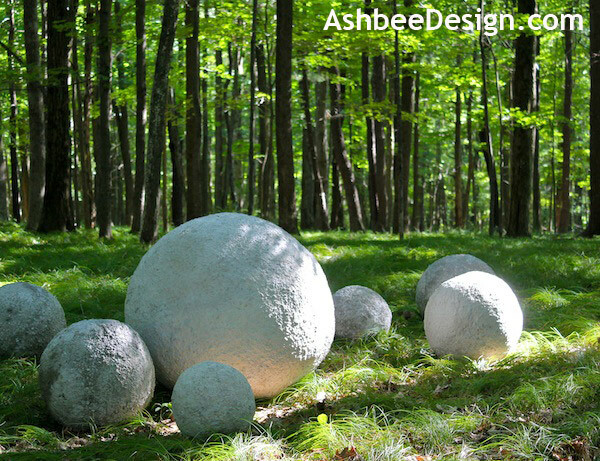 we are working on a sculptue lesson for high school students that would require them to cover several spheres with glue soaked string. I bought an 8'x4'x2' piece of styrofoam & chiseled 2 very large half circles, pinned them together with chicken wire & used wire coat hangers (cut & shaped into a "V")to attach the chicken wire. Added cement in stages & it turned out smooth & beautiful. Very, very easy. 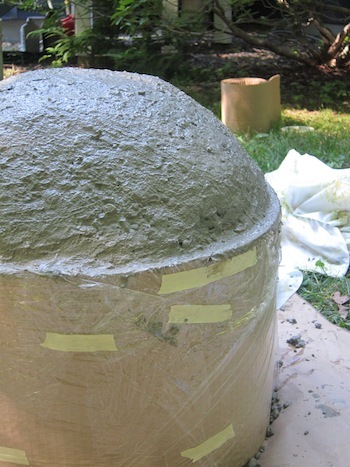 The chiseled half circles will not be smooth, but that's where the cement fills in the low spots! 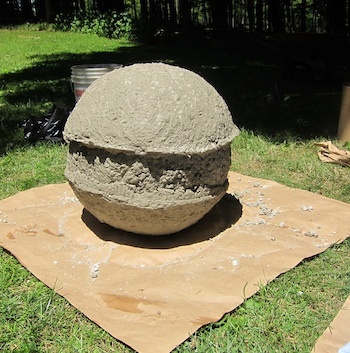 What about starting with plaster of paris, to get the strength so the ball won't pop, then covering with cement?